5100 Watts - DJ System - Dual 15" Speakers - Play from your Laptop or Cd's. - Ready to ROCK THE HOUSE! 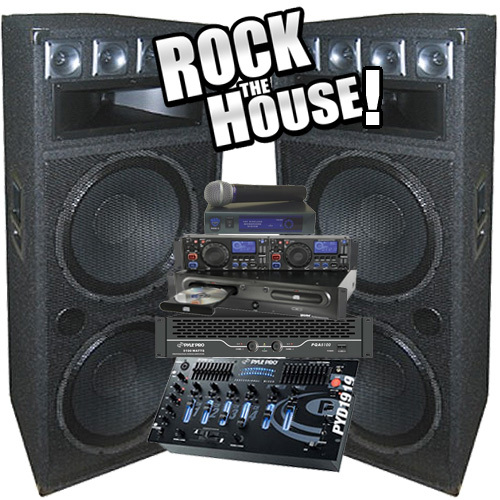 This complete DJ system is all about big house sound! 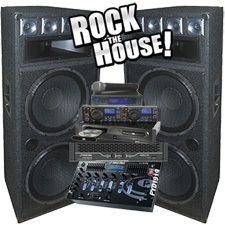 Mobile DJ's, Night Clubs and Houses of Worship make this system incredibly popular. Feel the music with tight, punchy lows and crisp highs. It doesn't get any better than this. This system is complete with everything you need including two huge dual 15" speakers, a 5100 watt power amplifier, dual cd player, DJ audio mixer, DJ case and all the wires you need. Awesome speaker for Karaoke, Mobile Disk Jockey or a Small Club. The TR-300 is a designed to provide extremely high SPL levels required in demanding stage and club environments. The dual 15" woofers feature high temperature voice coils and are topped by a large compression horn midrange and four bullet tweeters. This rack-mountable professional power amplifier packs a huge punch – 5100 watts of maximum power. This amplifier is equipped with dual ¼” and RCA inputs as well as dual speakon, ¼”, and banana plug outputs. The dual output level controls allow you to tweak your levels to your exact specifications. The soft start limiter prevents turn-on damage to your speakers. It’s all powered by a high quality ring transformer that eliminates transients and maximizes sound quality. Run in stereo, or bridge with another amplifier for even more power. The CDX-2410 Dual CD player acts as a convenient, versatile rackmount solution. Occupying just two units of rackspace, the CDX-2410 offers playback capabilities for audio CDs, CD-Rs and MP3-CDs across two decks. Complete with a range of professional DJ features, this unit is designed to provide excellent control in a wide range of applications. Ideal for mobile and wedding DJs, as well as bar, club and restaurant installations, the CDX -2410 features two independent jog wheels that allow you to search through a track, adjust a cue point and even pitch bend like a pro. Plus, a Pitch Control slider offers maximum control when beat matching, while a Loop Section with Reloop enables you to take song-shaping creativity to the next level. Handy playback features like Single and Continuous play modes, along with Instant-start, enhance the CDX-2250’s flexibility. The unit also has a Program feature that supports playlist creation, so restaurant and bar owners can provide music for their customers without having to worry about controlling the unit. And for seamless performance night after night, the CDX-2250 features anti-shock using RAM buffer memory, ensuring external bumps and vibrations won’t disrupt your performance. The ability to create cue points quickly and easily, and preview those cues, enhances the unit’s convenience, allowing you to craft an expert mix with ease and confidence. And for simple, swift navigation of songs, the CDX-2250 features a large, blue-backlit screen that displays a variety of track information, including time, pitch value and track number. Perfect as a professional, user-friendly solution for your DJ rack, the CDX-2250 offers impressive functionality and supremely reliable performance in a compact 2U design.